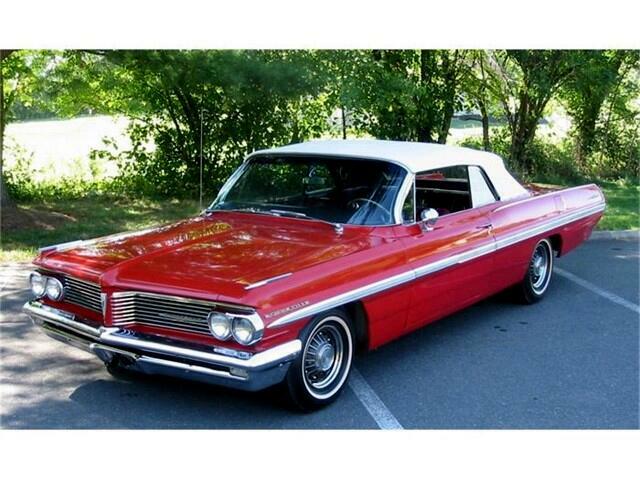 1962 Pontiac Bonneville convertible with new convertible top along with new top weatherstrips, top cylinders, and more. This is one of the most well equipped 62 convertible you will ever see. It has automatic transmission, power steering, power brakes, power windows, power top, factory air conditioning, bucket seats, console, leather interior, wonderbar radio, 8 lug aluminum wheels, tinted glass, rear trunk spin out light, It is an original California car with original paint and interior. Bumpers are NOS and mint. An outstanding car and super rare. How many original paint red 62 convertibles can there be left? Message: Thought you might be interested in this 1962 Pontiac Bonneville.